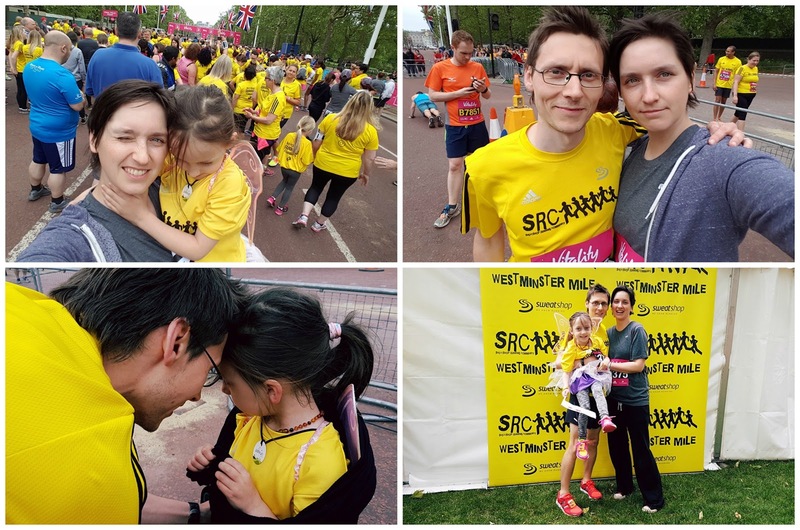 The Westminster Mile has become one of those races that I just keep returning to year after year, so far there have been four events and I have attended three (2013 and 2015 being the other two - I missed 2014 as I was travelling to Germany for a half-marathon). 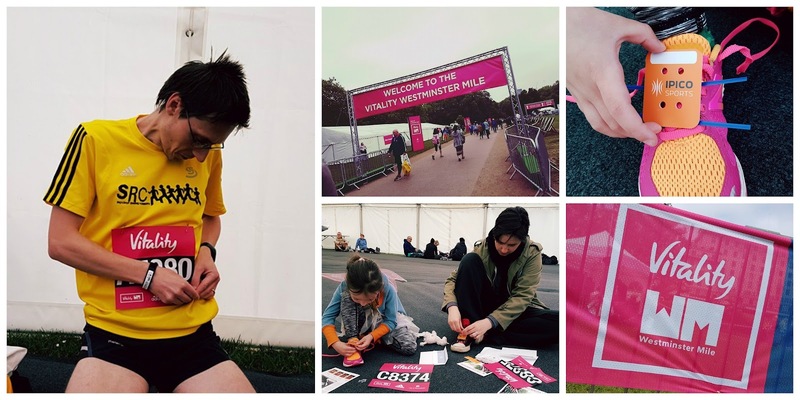 This event has grown off the back of the London 10,000 which took place the day after and turns the weekend into a celebration of running. Even though the race itself is good enough, it's all the other small things that makes this a great event. We stayed over in London the night before the event and even had time to visit Highbury Fields junior parkrun (blog to follow) before heading over to Green Park to the main hub of the Westminster Mile event. This year was a little different because instead of just myself racing, I had registered my wife and daughter as well. We had entered as part of the Sweatshop Running Community and made our way to the SRC tent where we did our last bits of preparation. Me and Matilda were both wearing our New Balance Zante v2 running shoes (blogs: mine / matilda's). Sweatshop had three waves of runners, A, B, and C. I had registered first and my predicted finish time had me in wave A, while my wife and daughter were in wave C. I was a little apprehensive about the start time which was advertised as 11.55am because in 2015 the Sweatshop waves had been set off early which lead to some confusion and a little panic. This year. the organisers stuck to the advertised time slots which was a relief. So at 11.55am, wave A was despatched and all was fine. After 2015 where I went out too hard and suffered. 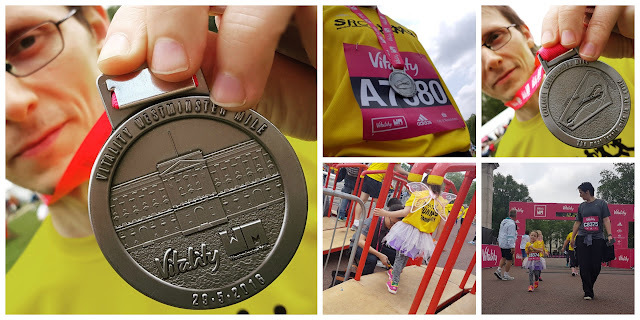 I decided to approach the race with a slightly different strategy this year - I went out at a strong pace but tried to keep things under control. My goal was to finish in under 6 minutes and while on paper this looked do-able, my own confidence was a little low and I was unsure if I'd be able to do it. The race had markers every 400 metres plus an extra one with 200 metres left, so I used these to judge how I was doing. I knew I had to reach 400 metres in around 1.30, and I passed this at 1.24 which made me a little nervous that I had gone out a little too fast. So I tried to stay relaxed through the second 400 metres in an attempt to reach the second half of the race in fairly decent shape. As I ran along Birdcage Walk I was overtaking other runners which was the complete opposite of how last year went, and mentally this really helped to get to the 1200 metre mark. The last 400 metres was a case of giving it everything that was left. It was at this point that I spotted one of my running buddies from Dartford. He was a good 10-15 metres ahead and I wondered if I might be able to reach him if I had left enough in the tank. As we turned the final corner and the finish line came into sight, I was about 5 metres behind. I really pushed hard and edged in front a couple of metres before the finish line. So a big thank you must go to Alec for giving me a target to aim for during that last 400 metres. After finishing I hung around at the finish area to await the arrival of my wife and daughter whose wave were just about to be despatched. About 12 minutes later they came into sight and they crossed the line together. The same post-race system was in place as was last year. First there were the timing chip removal stations and these were followed by the goody bag station. The race medal was inside the goody bag. We headed straight back over to the Sweatshop Running Community tent where we picked up our free lunch and found a nice spot to eat it. One of the great things about this event is that I find that I bump into so many people I know from various running groups, races and parkruns. It's such a great event for the running community and I have every intention of returning in 2017. The results were online later that day and my official chip time was 5.41. My wife and daughter completed their mile in 12.11. I've had a chance to think about things and I reckon that the track sessions I've been doing recently played a massive part in helping me to get the pacing for this just right. 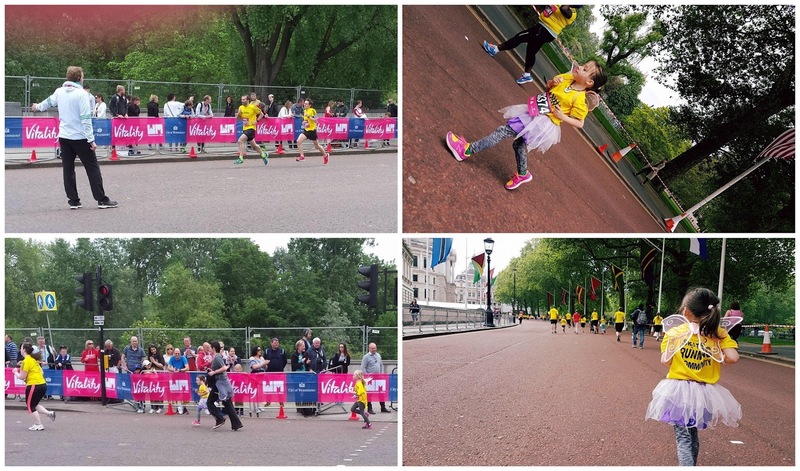 The following day I took part in the Vitality London 10,000 2016.